Realistic Surrealism. Making the impossible – possible – through the use of Color pencils. Each of these drawings takes over 100 hours to arrive at the detail and color depicted here. This hourly count does not include the understudy drawings – as many as 25 separate drawings – to solve scale, proportion, shadows and color variations. 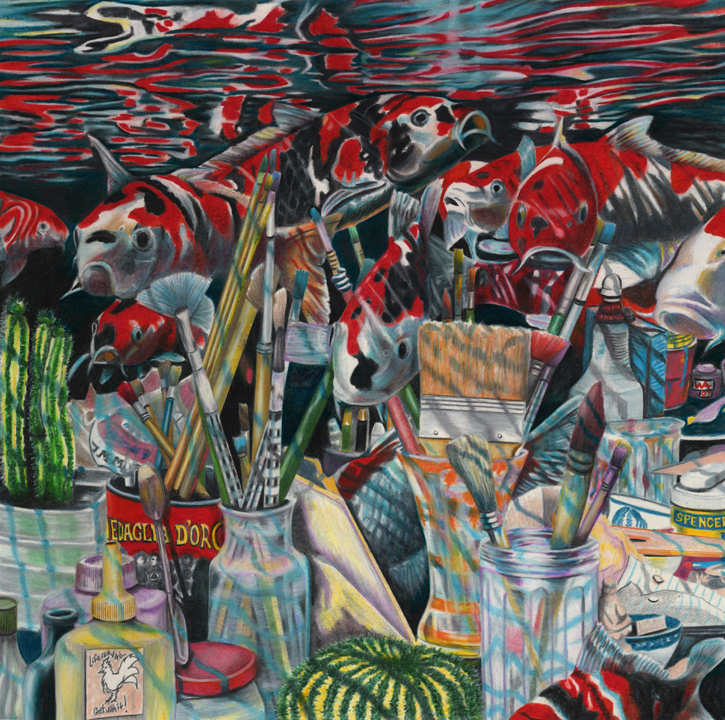 “Water Color” is a surreal Color pencil piece based upon the art studio of an artist and friend of Ken’s from Locke, California. The studio in Ken’s eyes was sheer chaos. Ken asked the Artist if he could take some reference photos to create a composition. The Artist laughed and said it couldn’t be done. Ken took the images and submerged the studio underwater, with Koi swimming through the space. Cactus have been added as an additional curious element. Ken presented the piece to the Artist at the local show where it had won 1st place. The Artist upon seeing his studio like that, nearly spit his wine out. 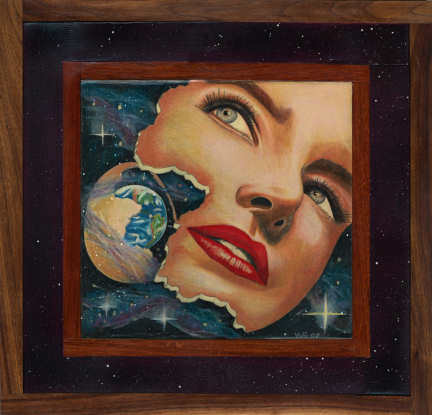 “Infinite Solutions“, a woman’s face, peeled back as a thin layer from the protective Egg that protects the Earth, contemplates the infinite nature of solutions to the many problems faced by contemporary peoples. The original art piece is drawn on three different types of woods. This is was an experiment using color pencil on wood, acrylic paint and sprayed numerous times to protect it with a clear coat. You can display this piece outdoors and water will not harm it.